Can This Red Cabbage Recipe Prevent Alzheimer’s? The Alzheimer’s association came out with a frightening report this week that you may have seen on the news. An astounding 5.3 million Americans are living with Alzheimer’s or some form of dementia and a new case is diagnosed every 70 seconds. That’s almost one half million new cases per year! And although I read far more about how they are trying to discover a magic drug to cure this terrible disease, I don’t see enough research trying to prevent it or linking it with nutritional deficiencies. The fact that the majority of Alzheimer’s and dementia patients also suffer from other serious degenerative disorders like hypertension, coronary heart disease and diabetes (often linked to poor diets and lack of exercise), suggests to me that this one is too. So a lifestyle that includes exercise and a healthy diet is not only beneficial for your heart health and blood sugar but should also help mitigate the risk of Alzheimer’s. Research shows that there is an increase in the accumulation of beta-amyloid protein in the brains of people with Alzheimer’s which could lead to cell death from free radicals. A study published in Food Science and Technology showed polyphenols in red cabbage, particularly its anthocyanins, can protect brain cells against this damage. Scientists Heo and Lee concluded that “additional consumption of vegetables such as red cabbages may be beneficial to increase chemopreventive effects in neurodegenerative diseases such as Alzheimer’s”. So yes, maybe my red cabbage recipe can help prevent Alzheimer’s. I developed this recipe one year when we planted a dozen red cabbage seedlings. A few months later we had a dozen, enormous, ripe red cabbages. I cooked these cabbages in every way possible but my favorite recipe was clearly Sweet and Sour Red Cabbage and Apples. It was inspired by the Pennsylvania Red Cabbage in my Better Homes New Cook Book. I liked the idea of mixing red cabbage with apples and the contrast of the brown sugar and vinegar. However, it used bacon drippings (I don’t eat bacon and if I did, I certainly wouldn’t be cooking with the saturated fat that dripped off of it); it used a bit too much sugar and added caraway seeds. So I took the things I liked about it and made it healthier. I encourage you to do the same. When you have a recipe you like but it’s got too many unhealthy ingredients, focus on the spices and ingredients that make it tasty and reduce the excess fat, sugar and salt. It’s fun to experiment and you might end up with a real gem! 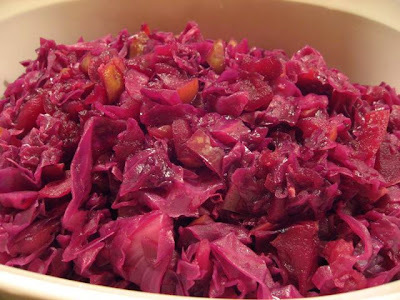 In a large pot, combine thinly sliced cabbage, diced apples, vinegar, apple juice, brown sugar, salt and pepper. Once boiling, lower the heat, stir and cook covered for 15 minutes. Remove the cover and cook uncovered for about 15 minutes, stirring often, until the liquid is evaporated, and the cabbage is the desired texture. Per serving: 108 calories, .2 g of fat, zero grams saturated fat, zero mg cholesterol, 2 g protein, 27.3 g carbohydrate, and 5 g of fiber. 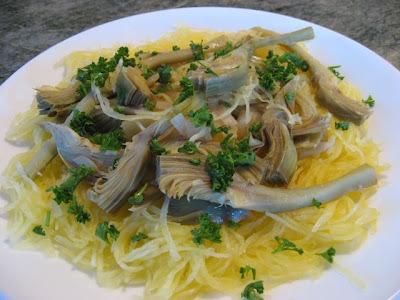 Baby artichoke sauce on spaghetti squash. Pulling the spaghetti strands from the sides. I lied when I said butternut squash was my last fling with winter squash this year. I couldn’t resist a spaghetti squash at the grocery store and I always have so much fun preparing them. OK, you’re asking, how much fun can you have with spaghetti squash? But, if you’ve never made it, you will be delighted when you turn this football shaped, 3 pound squash into delicate strands of low calorie spaghetti. If you are trying to get your kids (or anyone else in your family) to eat more vegetables, try mixing a little spaghetti with spaghetti squash for what I call, “double spaghetti”. Spaghetti squash can replace regular spaghetti in any recipe where you want to prepare a lighter dish that has fewer calories and gets you closer to your goal of 5 to 7 fruits and vegetables a day. One cup of spaghetti is 221 calories and 43 grams of carbohydrates. 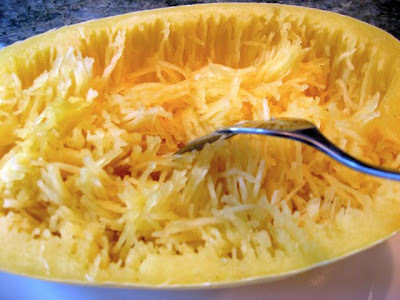 One cup of cooked spaghetti squash is only 42 calories and 10 grams of carbohydrates. So if you are trying to lose weight but still crave pasta, this can really do the trick! I’ll be sharing my brother Peter's vegetarian baby artichoke sauce recipe but first, let’s cook up the squash. Cut the squash in half, remove the seeds and sprinkle the insides with salt. Put them in a large pot and steam them in an inch or two of water. Some people bake them in the oven until the skin is soft but I worry that you can overcook them and not know until it’s too late. Overcooking causes the squash to be mushy and you don’t get the beautiful spaghetti strands that you are looking for. Steam for about 15 to 18 minutes or until a fork can gently pierce the inside of the squash. As soon as that happens, remove the squash halves from the pot immediately. Then, using a fork, gently pull the squash away from the sides. You’ll see little strands form. Continue to do this until all of the squash comes away from the skin. One large spaghetti squash can feed 4 people. Per 1 ½ cup serving: 63 calories, zero grams of fat, zero mg of cholesterol, 1.5 g protein, 15 g of carbohydrates and 3 g of fiber. Cook the spaghetti squash as stated above. Cook the whole wheat pasta according to directions. Toss together and serve with a sauce of your choice. Per serving: 147 calories, zero grams of fat, zero mg of cholesterol, 4.5 g protein, 31 g of carbohydrates and 4.5 g of fiber. 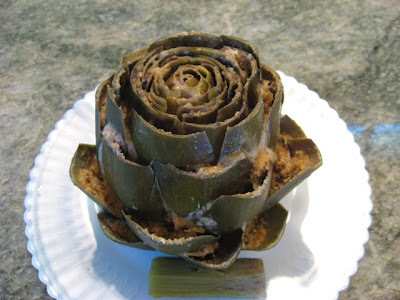 Clean the artichokes by removing several outer layers of leaves (don’t skimp – if you don’t remove enough of the outer leaves, as I found out, the artichokes will be tough). Leave the stem on and peel it with a potato peeler. Cut vertically into 8 pieces. Sauté the onion or shallot in the olive oil for a few minutes. Add the garlic and cook another minute. Then add the artichokes, white wine, salt and pepper and simmer covered until soft (about 30 minutes – but all artichokes are different so test the leaves occasionally). Add ½ cup or more of water or broth when the sauce starts to get too thick. When the artichokes are soft, stir in the zest and juice of a lemon. Put over 4 servings of spaghetti squash or “double spaghetti”. Cover with fresh chopped parsley and parmesan cheese. 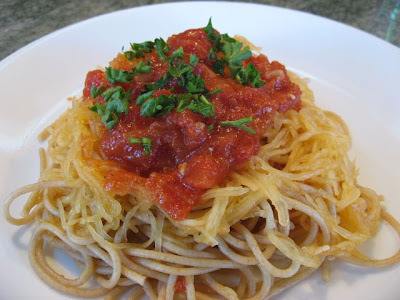 For a better melding of the flavors, you can mix the spaghetti squash or “double spaghetti” into the sauce first and then serve but it isn’t as pretty a presentation. Per serving of sauce: 128 calories, 4 g fat, 1 g saturated fat, 2 mg cholesterol, 4.5 g protein, 14.5 g carbohydrates and 8.3 g fiber. Mash dahl and squash with a potato masher to retain chunkiness. It’s almost spring and soon it will become harder to find winter squash but before that happens, let’s have one more fling! Although summer squash is delicious and low in calories, it is mostly water and doesn’t pack the nutritional punch that winter squash does. The deep orange flesh of a butternut squash is indicative of its high beta carotene content. The body converts beta carotene into vitamin A which is important for healthy vision, growth and development, healthy skin and proper immune function. People with night blindness, dry and scaly skin or who have more frequent infections are often deficient in vitamin A.
Butternut squash is also a very good source of potassium which is important for bone health and is critical in maintaining the proper functioning of the heart, nervous system and the regulation of blood pressure. A good amount of manganese is also found in this winter squash which supports amino acid and carbohydrate metabolism as well as bone health, blood sugar balance and energy production. Butternut squash is also high in fiber and vitamin C.
This spicy soup recipe makes a hearty vegetarian meal. I served it at a dinner party last night along with a salad and some mini corn muffins. Although most of the guests were not vegetarian, no one missed the meat. 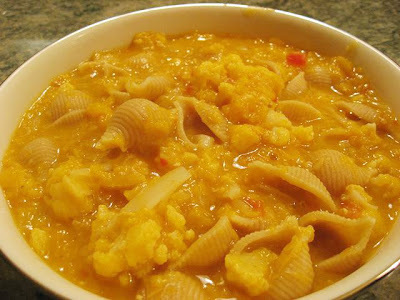 Its heartiness and high protein content comes from the red lentils and whole grain pasta shells. The squash, cauliflower, red lentils and whole grains also contribute to the 10 grams of heart healthy fiber per serving which also makes it a filling dish. The “heat” or spicy flavor comes from an old favorite I learned about at the University of Texas – Rotel tomatoes. I recently rediscovered them in a nearby grocery store. I shunned them for many years because I associated them with their famous but extremely unhealthy Velveeta cheese “Queso Dip” recipe which packed 1,410 calories, 99 grams of fat, 64 grams of saturated fat and 8,020 mg of sodium. But I threw the baby out with the bath water when actually the Rotel tomatoes themselves have no fat and are low in calories with only 50 calories in an entire 10 ounce can. They also have an abundance of lycopene from the tomatoes which is said to help lower the risk of prostate cancer. Although Rotel tomatoes are high in sodium, you can use it to flavor your soup if you are careful not to add too much additional salt. If you can't find them, just use a can of diced tomatoes with a fresh jalapeno. In a 5 1/2 quart Dutch oven, heat olive oil and sauté onions until soft (about 5 minutes). Add garlic and cook an additional minute or two. Add the broth, butternut squash, dahl, Rotel tomatoes, cumin and coriander and bring to a boil. Lower the heat and simmer for 30 minutes. 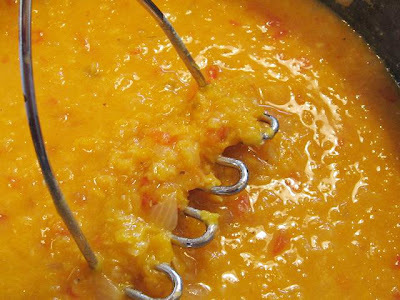 After the soup cooks for 30 minutes and the dahl is soft, mash the squash and dahl in the pot with a potato masher (some might wish to puree but I like the resulting chunkiness of the soup and to be able to see the red streaks of the tomato). Stir in the coconut milk and the cauliflower flowerets and simmer for another 10 minutes or until they are just soft but not mushy. Add the fresh lime juice, add salt to taste. Right before serving, stir in the cooked pasta shells, and enjoy. Per serving: 340 calories, 5.7 g fat, .3 g saturated fat, 13.6 g protein, 60.5 g carbohydrates and 10 g of fiber. 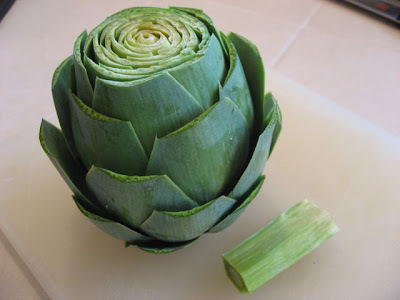 No celebration of the vegetable would be complete without my favorite food, the artichoke. My mother would stuff them with a breadcrumb mixture and steam them until they almost fell apart. Eating them was a learned skill – one that is taught to Italian children at a young age. First you gently scrape each leaf between your teeth enjoying the artichoke leaf and filling together. When the leaves are finished, you lightly salt and eat the bottom after removing the “choke”. Then there is the game of trying to get others at the table to give you their stems and bottoms (the most coveted parts of the artichoke). Ah the childhood memories! Sometimes my mother would wrap one up in foil and put it in my lunch box. Children would point and stare as if they had never seen one in their lives. I guess I should have felt embarrassed but any feeling of shame was surpassed by my sheer enjoyment of eating my very favorite food. Artichokes are very high in fiber and provide a healthy dose of Vitamin C, Vitamin K, folate and manganese. 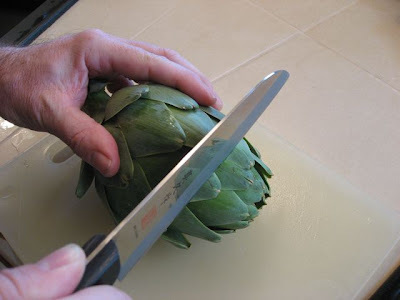 Holding the stem, cut the pointed top of the artichoke with a sharp knife. Then, with a pair of scissors, cut the tops of each of the remaining leaves by about ½ inch. 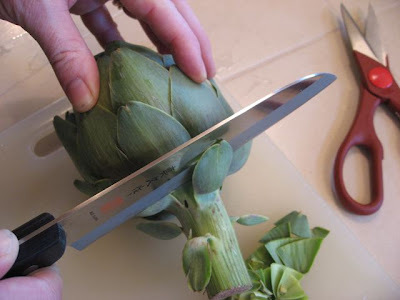 Remove the bottom stem with a knife so that the artichoke can sit flat. Peel the stem and set aside. Wash the artichoke under cold water while slightly opening the leaves. Drain upside down while preparing the filling. In a small bowl, mix the bread crumbs, parsley, garlic powder, parmesan, salt and pepper. With a teaspoon, fill each leaf with a small amount of the mixture. Place 4 artichokes on a steamer in a large, deep soup pot with water coming up slightly above the bottom of the artichokes. 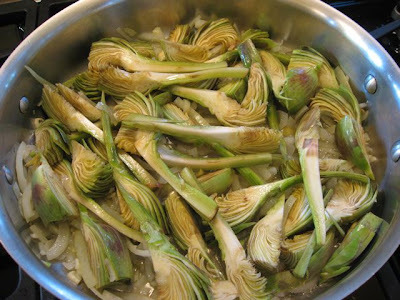 Drizzle a teaspoon of olive oil on each artichoke. 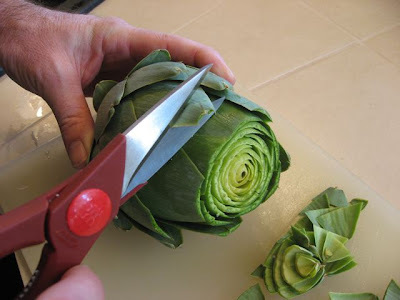 Place the stem on top of each artichoke. Sprinkle a little salt over the stems and tops and steam for 1 to 1 ½ hours or until the leaves can be easily removed and the leaves are very tender. Add more hot water to the pot as the water level goes down. Per serving: 233 calories, 7.5 g fat, 2.3 g saturated fat, 8.5 g protein, 33.5 g carbohydrates, and 11.3 g of fiber. The American Cancer Society recommends eating 5 or more servings of fruits and vegetables each day to help prevent cancer. If you actually ate that many low calorie, phytochemical and antioxidant rich foods each day, you would also be going a long way to preventing other diseases as well, such as diabetes and cardiovascular disease. So why are so many people not able to reach these minimum levels even though they totally understand their importance? One of the reasons, I believe, is that many people just don’t know what to do with them. My son and I had a long discussion about this on his last visit home. He was making this amazing mushroom bourguignon and I told him how incredibly proud of him I was that he could cook such a beautiful meal so effortlessly. Besides creating this incredible vegetarian dish, he appeared to be enjoying himself immensely. We then had this long talk on how many men and women, young and old, don’t really feel that they need to cook. Some even feel that it’s beneath them—that their successful careers have “liberated” them from this horrible chore. He told me that he really respected me for being able to have an important career and still care about cooking my family a healthy meal and teaching my children how to do the same. I have never been paid a greater complement. I believe there are several factors in play right now that are encouraging people to return to the kitchen, or even find it for the first time. One, it’s a lot cheaper to eat at home. With the state of the economy and so many people out of work, this is a big motivation to cook. Two, it’s safer. I’ve heard of more cases of food poisoning this last year than in the last ten. I just saw a news clip showing an insurgence of rats in New York restaurants as their owners can no longer afford to exterminate. It will take a while to get that visual out of my head. Three, it’s healthier. You can control what and how much you prepare. You can select healthy, organic vegetables, hormone-free meat and dairy and leave out the excess fat and salt usually found in restaurant prepared dishes. Four, it can be fun. You can make it an event with everyone having something to do—chop, decorate the table, making a dessert. My friend Lisa and I still remember many nights of cooking together when we were neighbors—drinking a nice glass of wine while making our favorite chanterelle mushroom risotto. If you live alone, cook a meal for two or even four and enjoy leftovers during the week. Light a candle, pour a glass of sparkling water and enjoy yourself knowing that you are doing something wonderful for your body. It’s important to take the time to do this because it is too easy to fall into a pattern of just eating a bowl of cereal because you don’t want to cook for one. Eventually your health will suffer. 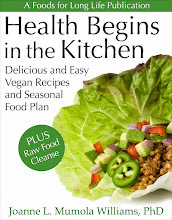 So I want to encourage you to not only cook but get committed to creating meals that will nourish and heal you. Put more and more vegetables on your plate. I will continue to present you with new, delicious and healthy ways to prepare them. In fact, I will dedicate March to “Celebrating the Vegetable”. 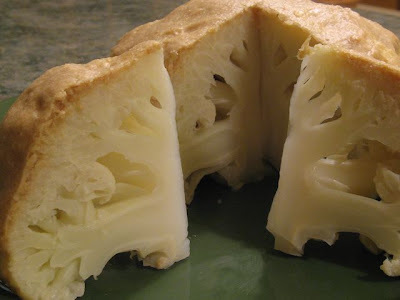 Here’s an elegant and unusual way to prepare cauliflower. Rich in the phytochemical, sulforaphane, this cruciferous vegetable has tumor fighting capabilities. It’s also high in dietary fiber, Vitamin C, Vitamin K, Vitamin B6, Folate, Pantothenic acid, Potassium and Manganese. Preheat the oven to 350 degrees. Keeping the cauliflower whole, remove the leaves and stem and wash under cold water. Steam whole for 22 minutes. 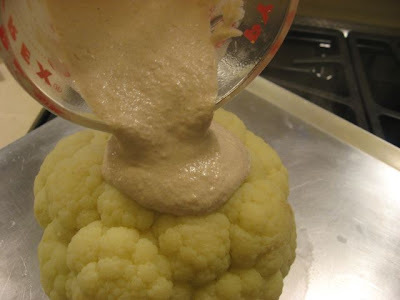 While steaming the cauliflower, prepare a lemon-tahini paste with the remainder of the ingredients (you may have to add additional water or flour until you get a good consistency that will stick to the cauliflower). 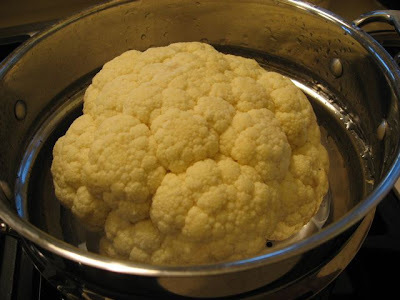 Carefully remove the cauliflower from the steamer and place it on a slightly oiled cookie sheet. Pour the lemon-tahini mixture over the cauliflower and with a butter knife, cover the top and sides as if you were icing a cake. Bake for 30 minutes, until the crust is firm. Cut into slices with a sharp knife. 14.8 g carbohydrate and 5 g of fiber.